Baby Playards - All in One Nap and play, home and away. The 4-in-1 Evenflo Arena Playard grows with your child, offering four uses in one convenient bundle. Newborns will feel cozy in a soothing, removable napper that rocks baby to sleep and includes 2 delightful soft toys. 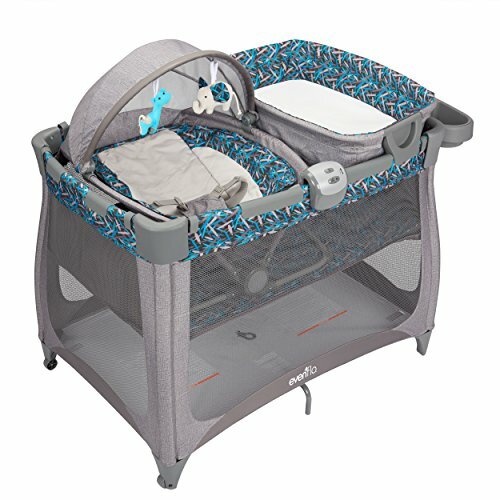 Older babies will enjoy relaxing in the removable bassinet with calming sounds and lights module. The changing station includes a sturdy changing table and spacious, practical storage cubbies designed to handle all baby's essentials. When they're ready, the Arena transforms into a safe playpen.Evenflo has over 90 years of experience. For over 90 years, Evenflo has developed a reputation as a leading manufacturer of high quality products for babies and children. With this history comes the foundation of trust we have established with parents to provide reassurance they are making the best choice for their newest, most precious family members. We continue to strive toward achieving our mission to provide quality products for children and those who care for them.